Explore the ISLE OF GUILDMOOR! This is version 0.1 (beta) of rules for The Isle of Guildmoor! Tell me if you (with perhaps a friend or two) want to adventure on the ISLE OF GUILDMOOR! GUILDMOOR is an island dotted with friends, foes, lairs, treasures, and mysteries. Using Pathfinder RPG, you can use any race and monster as a base for your character(s)! Your “Team” is all the creatures that you can control on the Isle of GUILDMOOR. Your Team will find and discover things that other Teams need NOT know. Some things you encounter in GUILDMOOR will too be challenging for your group to face alone. You might want to return to them after you grow more powerful. Every day of the Guild will be 1 turn. Depending on what you do on your turn, you can encounter monsters and earn XP, find powerful magic items, gain new allies, and/or find clues about quests. When your team gains enough XP, you level up and your Team can gain levels! You can also tell me ideas of something people can encounter, and I might put it in GUILDMOOR. You can earn XP for createing locations and encounters that other groups will find! 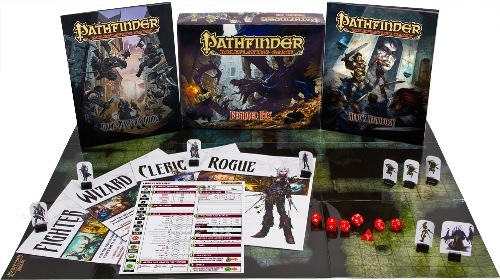 We are using the Pathfinder RPG because of the huge amount of options and flexibility it gives. The Grandmaster can help you in learning how to play Pathfinder: it really isn’t that different from other systems, especially once you have created your character(s). The “XP Budget” of your Team when you start is 3,200 XP or (Challenge Rating (CR) 7). This means you can have one CR 7 creature, two CR 5 creatures, three CR 4 creatures, one CR 5 and two CR 3 creatures, eight CR 1 creatures, etc. An individual creature’s CR is a combination of its race and its class levels. 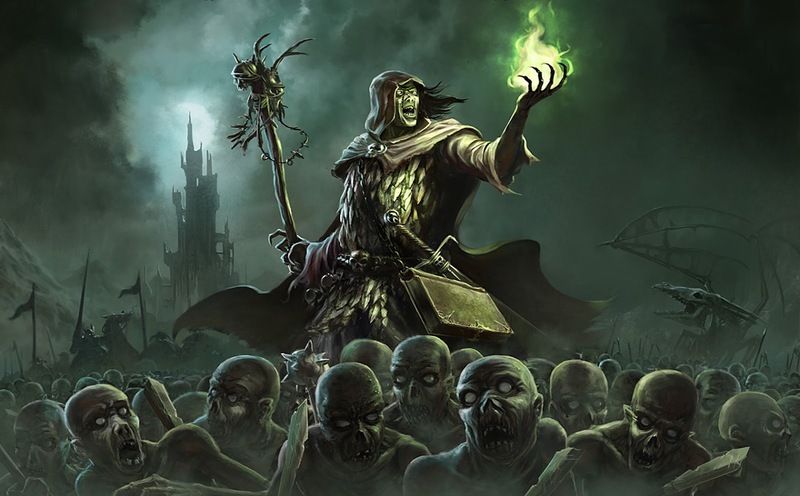 Most standard Pathfinder races (humans, goblins, ifrits, etc.) get no base CR from their race. Each PC class level (fighter, wizard, etc.) adds +1 to the CR. NPC class levels (warrior, commoner, expert, etc.) add one less than PC levels do (minimum ½ a CR). A creature must have an Intelligence of 3 or higher to have class levels. A Level 3 human wizard is a CR 3 creature, and uses up 800 XP of your XP Budget. A Level 3 wizard ogre is a CR 6 creature (CR 3 from being an ogre, and +3 to the CR for 3 PC class levels), and uses up 2400 XP of your XP Budget. Ability scores: Creatures with PC levels who are your avatar can use unrestricted 15 point buy to determine ability scores. If a creature is NOT your avatar and has class levels, then if it has PC levels (e.g. fighter, wizard, etc.) then it starts with the HEROIC ARRAY of 15, 14, 13, 12, 10, and 8 before racial and other modifiers. If it has NPC levels (e.g. warrior, adept, expert, commoner, etc.) then it starts with the BASIC ARRAY of 13, 12, 11, 10, 9, and 8. Money: Your combination of class levels and base creature CR also confer a gold budget to outfit your group with gear that corresponds to Pathfinder RPG guidelines. 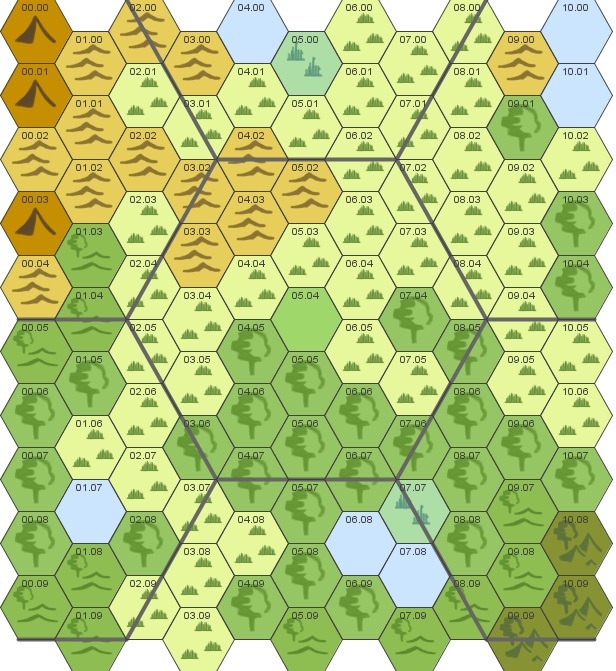 Your Team all starts together, in a single hex on the map. Other students and I will GM your turn. Encounters will be short – think 10 minutes or less. It can be a fight. It can be a couple living in a hut in the woods. It can be a cave entrance with a single encounter, like some monsters, a trap, or a combination of both. You may be rewarded with XP, gold, magic items, “quest items,” or information! 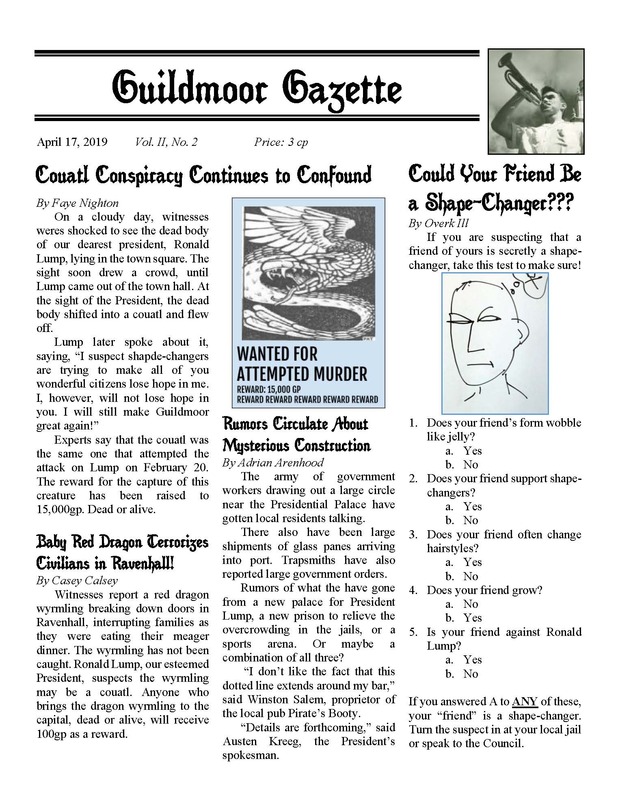 Guildmoor Gazette #3: Fire, Death, Rage! As yesterday’s rally marched toward Castle Guildmoor, explosions rang out at Lavinia’s firearms shop, causing a fire that destroyed the shop and half of Fluffy Bundts Bakery. During the fire, Lavinia was murdered in her chair at Teresa’s Tonsorial Parlor. Grizzleby, the town sage, arrived soon after, but the perpetrator had already left. At the firearms shop, an improvised bucket brigade put out the fire, but not before spreading to the neighboring Fluffy Bundts Bakery. Luscious Lucinda, covered in flour, still passed out bundts to the volunteers. Captain Staunton, when pressed about whether half-orcs or the thieves’ guild might be behind the troubles, demurred. “We cannot reveal any of our leads until our investigation is complete,” he said. The Guildmoor Merchants Association and the House of Winston sponsored a rally of about one hundred in the town square that marched to Guildmoor Castle, demanding greater protection against recent robberies and violence on town shops. “We have emptied our city coffers protecting half orcs and providing free healing for all, while honest men and women have to fend for themselves,” said Branford II of House Winston. 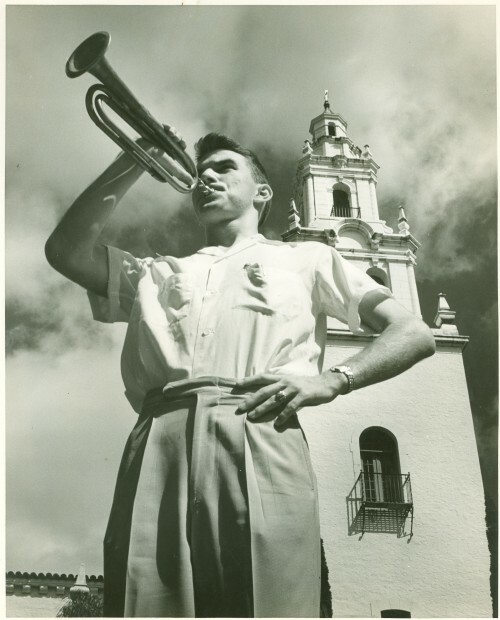 The Merchants Association organized a volunteer brigade to supplement the town guard. Emotions ran high, when news arrived that Devyn Colby, guard of the Ainsworth Weapon Shoppe, died from injuries sustained while defending his shop on Wednesday night. Regent Ronulus reports that new land has been cleared for farming, and that prospective farmers are to report to Castle Guildmoor for more information. Luscious Lucinda insists that the Bundt-Eating Contest is on for this Saturday. 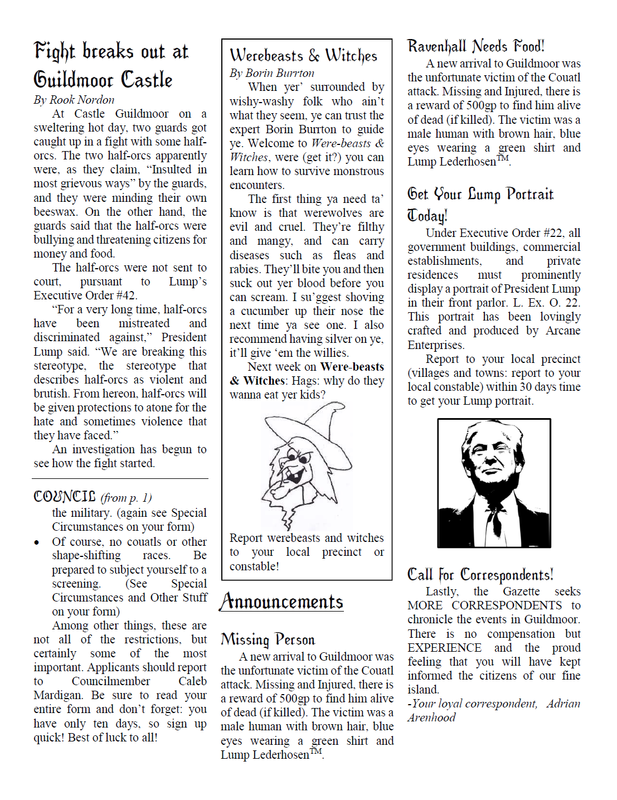 Guildmoor Gazette #2: Guildmoor is Haunted! Lavinia, proprietress of the Tinder Box store, was accosted by some ghost-like creature while opening her store on Wednesday morning. She reported the apparition to local guards, who dispatched it quickly. “I feel like I’ve aged ten years,” said Lavinia. She has set an urgent hair appointment with Teresa’s Tonsorial Parlor to deal with her new greys. The town sage, Grizzleby, tended to downplay the problem, I, your faithful reporter, did more investigating. Apparently, incorporeal creatures can only be harmed by magical weapons. Thankfully, the town guard has such items in stock. The Harbormaster is offering a reward of 100 gold to anyone who has more information on the low number of fish in Lake Guildmoor’s waters. 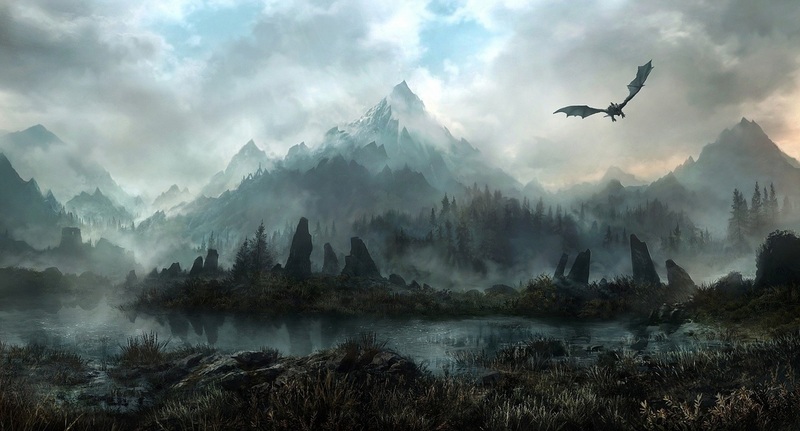 Guildmoor Gazette #1: A DRAGON in Guildmoor? A large flying lizard — either a drake or a dragon — was seen by the docks on Sunday! Harbormaster Jenkin states there is no cause for alarm. Calls for his removal increase. Regent Ronulus will meet with the harbormaster today to discuss increasing security at the docks. Regent Ronulus did not step outside, despite protesters’ demand that he do so. A representative did meet with protesters and promised that the Regent would investigate Saturday’s mysterious death of Snubub. Luscious Lucinda continues to amaze townspeople with her delightful bundt cakes. Lucinda also seeks to dispel the “groundless prophecy” from Grizzleby that the 2nd Annual Bundt-Eating Contest this Saturday will be beset by heavy rain. 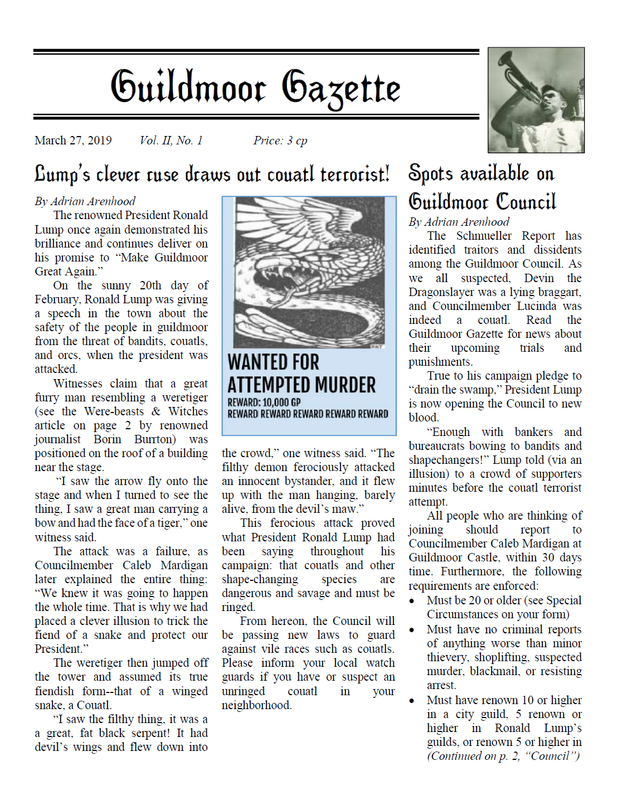 Lastly, the Gazette seeks MORE CORRESPONDENTS to chronicle the events in Guildmoor. There is no compensation but EXPERIENCE and the proud feeling that you will have kept informed the citizens of our fine town. Here’s some more info on the sandbox campaign of GUILDMOOR that we will have in the Guild. Remember that I must hear from teams before Spring Break! Again, Rule #1 for GUILDMOOR is that you can think up and do anything, BUT it must be something your character(s) would do. The characters in your Team have their own ambitions, hopes, motives, and fears. What those are, YOU can define first. IF your avatar is a creature that has class levels (remember, you can be something from the Bestiary if you want to, or a creature from the Bestiary that has class levels! ), you begin with an unrestricted 15 point buy to determine your ability scores! If a creature is NOT your avatar and has class levels, then if it has PC levels (e.g. fighter, wizard, etc.) then it starts with the HEROIC ARRAY of 15, 14, 13, 12, 10, and 8 before racial and other modifiers. If it has NPC levels (e.g. warrior, adept, expert, commoner, etc.) then it starts with the BASIC ARRAY of 13, 12, 11, 10, 9, and 8.